This stunning secluded villa offers luxury accommodation and unrivalled panoramic views over the bay of Cannes. All bedrooms have air conditioning / en-suite bathrooms and all rooms open onto the sea-facing terrace; guests will long remember the romance of waking up to sunrise over Les Iles des Lerins. The large sitting room looks out over the red rocks of the Esterel coast through 2 large full length glass doors. There are spacious terraces on 2 levels with numerous areas for private relaxation. The heated pool also has stunning uninterrupted sea views and ample sunbathing space - it is suitable for children with a shallow end and a sonar pool alarm (fully conforming to French law). There are eating areas both outside and in, with a built in 'plancha' barbecue next to the spacious well-appointed kitchen. There is also a heated jacuzzi hot tub and 2 hot outside showers. Other features: There is a fully equipped utility room with washing machine, tumble dryer, iron, clothes lines etc. There are also office facilities, including colour printer and fax machine, as well as wireless 8Mb broadband internet access, a 40 inch Sony LCD TV with DVD player and satellite TV / hard disk recorder with French TNT high definition digital TV tuner. The studio has separate satellite TV, and French digital TV. There wis a 5-zone Sonos wireless music system. Golf facilities: There are approximately 10 excellent 18-hole Golf courses within 30-40 minutes drive, the closest 10 minutes away. Skiing and Winter Sports: The Villa is situated 1-2 hours drive from excellent Winter Sports and Skiing facilities in the Alpes Maritimes. All bathrooms have lavatories and showers and have recently been refurbished to a high standard. All towels are provided for both bathrooms and pool. There are stairs down from the car parking area but these are easily managed by most elderly people. There is an office area with fax and separate computer printer. There is a laundry area with washing machine and tumble dryer. The villa is spectacular - lovely views and very comfortable pool area. If you are looking for a really beautiful, comfortable and peaceful location then this villa is as good and romantic as it gets. Every detail is carefully thought out to make your stay as comfortable and enjoyable as possible. It’s all so lovely that you just don’t feel the need to go anywhere else - it’s so relaxing and has such a lovely atmosphere . The time passed all too quickly . This beautiful classic French villa with stunning views over the Mediterranean provided an ideal location for our family get together. We mainly eat in, buying food from the local Theoule farmers shop (7 minutes) and the Giant Hypermarket (15 minutes); but when eating out we had a wide range of choices from Michelin starred restaurants to excellent bars and brasseries overlooking the Med. If you want to spend your time lying on long golden sandy beaches this is not the place to go. This section of the French coast has some beaches, but they are not great. For everything else though this villa is wonderful. Breakfast on the terrace as the sun rises over the Mediterranean; lying by the pool seeing the super yachts sail into Cannes; watching the once weekly Nice firework display whilst sipping bubbly on the terrace; it would be hard to find a better holiday experience. I thoroughly recommend that you spend one evening visiting Mougins, a hilltop village about 25 minutes drive which is an oasis of lovely bars, restaurants and art galleries with beautiful views over the hills. We will be staying at Villa Ogilvie again. 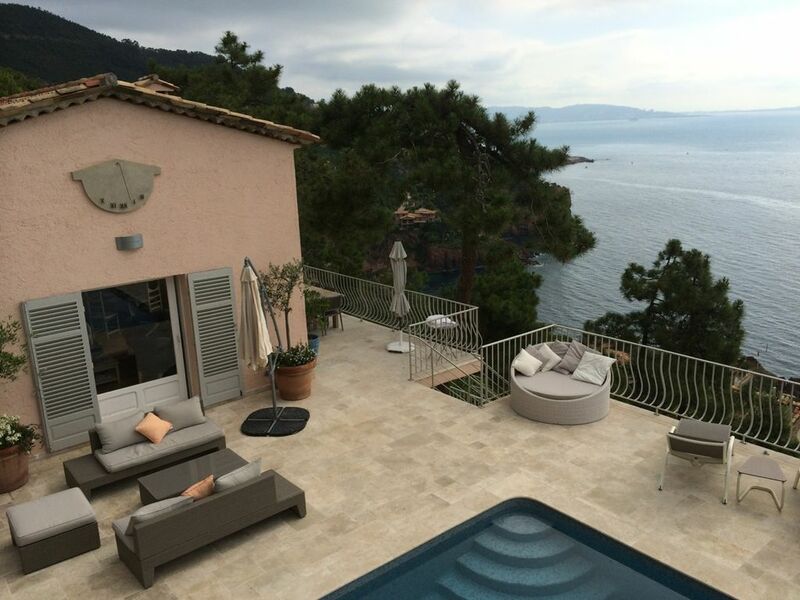 An amazing villa in a stunning, tranquile area looking over the bay of cannes. We did not hire a car but the bus that ran from outside the villa was always right on time taking 5 minutes along a beautiful coast road into Theoule sur mer. We had access to electric bikes which were fantastic for seeing the gorgeous sites on. All the beds were very comfortable with air conditioning in each room. We spent most of our time on the top pool terrace which led out from the lounge and kitchen. The pool area was gorgeous with the sun shining all day long but was also great as we could also access shade if needed. There were plenty of sun beds, sofas and seating on the terraces provided. We had great fun having table tennis cimpetitions located on the lower terrace. This villa was absolutely amazing and i will definatly return next year. Many thanks Philip. So glad you enjoyed it - you were fabulous guests and are welcome back any time! Even the stunning pictures do not do the view from this villa justice, they are quite frankly spectacular. We were two families consisting of 4 adults and 5 children, and the accommodation absorbed us easily for our weeks stay, in fact we didn't even use the den/5th bedroom. The villa in decorated beautifully, all light colours and whites, very stylish and fresh. The feature room is the lounge which has a double aspect over the pool and then the views across the bay. We received very helpful communication before the trip, including essentials about the villa, ideas for days out and directions. On arrival we were greeted by Crystel and her daughter who helped show us around and gave some advice about the pool and hot tub etc. There are lots of nice little mod cons, such as the Nespresso machine, Sonos sound system and decent wifi. When we needed the pool given an extra clean mid way through the stay, then Fabrice was down that same day to top it up and get it ship shape for the next day. There is a table tennis table which got extensive use and the two terraces provide lots of space for play. There lots of seating areas around the pool and on the terraces to unwind and read a good book. The location is very quiet on a hill off the main coast road up from Theoule sur Mer. The sandy beach is a 10 minute drive and there you will find a number of good restaurants and facilities like a post office. For more lively towns there is Cannes close by and Antibes too offers a great place to visit and enjoy a meal. We could not have been more impressed with the villa, the communication with the owners, the support whilst we were there. It was a home from home and the view is now my screen saver! We could not recommend it enough! We stayed here for 2 weeks at the end of August and loved it. We were a mixed party of children, teenagers adults and an Oap. The Villa is absolutly charming, and has everything you could need. The views are to die for and the weather was amazing. To sum it up we all had a fabulous holiday and have been dreaming of our little piece of heaven ever since. Thanks for the kind words. We too dream of the villa, especially on rainy Mondays in London! There is a huge area for walking in the nearby parc de l'Esterel, and further afield in the stunning Gorges du Verdon (Grand canyon du Verdon). Golf: There are approximately 10 excellent 18-hole Golf courses within 30-40 minutes drive, the closest 10 minutes away. The property will be cleaned and prepared before the rental, prior to arrival. On departure the property will be prepared by our employees prior to the next guests. Payment for required extra cleaning may be taken from the security deposit prior to its return.